What a month we had. Google released updates one after the other close to 60 algos in little over four weeks. From now onwards fooling Google that our website is popular and valuable by stuffing with keywords, duplicating content and building junk links is almost over. Authoritative content: Google claims that with a modified signal it can identity authoritative content. This is still unclear how Google concludes ones content is authoritative. My guess is through number of social signals like tweets, likes and plus. Also the author of content displayed through rel=author that is through Google + profile. Influence in ranking changes of this update: No Idea. Keyword Classifier: A big blow for the stuffers and spammers. High usage of keywords in the web page is the old mantra and certainly a strategy to rank high in Google. Google has better technology to detect keyword stuffing. Influence in ranking changes of this update: Huge. Domain Diversity: Unlike in past, Google, Now, has limited the ratio of showing the same webpage for multiple search terms. Instead of targeting 10 to 15 high search volume and competitive keywords in homepage we can concentrate on sub pages. Websites that are getting high rankings for many keywords have given way to other websites. The keywords have cut down to 5 to 8 keywords for a website. Influence in ranking changes of this update: Medium. Google finds relevancy among paginated results and ranks the website. It articulates the phrases from different pages that has continuity in content from one to other and ranks the keyword. Penalizes anchor text over optimization. Targeting same anchor text for higher rankings. Think once again. Vary the anchor texts. Ranking for the fresh results. This helps largely to the online new websites, publishing domains, portal sites. Ranks for unique descriptive and meaningful title tags. Keyword stuffing in Title and Metags may sink your website to the new level of abyss. Now that Google is sending its two Heroes Panda3.5 and Penguin to remove the poor quality content and less valuable website from search engine. The changes in website are inevitable. Penguin algorithm came at a time big websites are facing the duplicate content issue in their website. The more versions of panda released the less search traffic got for panda hit websites. Adding salt to these wounds, Penguin is penalizing for web spam and keyword stuffed websites. The road to traffic recovery is hard. And regaining the lost paradise of Google rankings is much difficult. In this grim situation don’t hit panic button and jump to any quick conclusion. For next 3 to 4 days check the rankings and analyze the traffic of website. Disappearance of rankings and lost traffic may occur due to two reasons. One, Penguin update or Two, Panda 3.5 update. I won’t give you any SEO magic wand to your rescue. There are no new instructions to follow. What the intention behind this post is make you remember the Google guidelines that forgotten in the quest of rankings. As I said this is not new to everyone. Make title tag and description meaningful and readable. Penguin hates too many same keywords in 90 characters of title tag and 150 characters of description. Three years ago, a trend started in on page optimization. It was common to see the keywords of small font size with hyperlink to home page above or beside the logo. And who can forget the footer getting abused. Plethora of keywords completely occupied the footer of website. For a minute, stare the layout of the website. Do you remember the website designed without SEO elements involved in it? Please ask the first psd file of home page from web designer. See now how the website is, in the name of off page optimization. It’s completely filled with the keywords. Remove all the unnecessary keywords and bring back the beautiful website what it was once. Make user friendly and offer better user experience to visitors. Keywords, Keywords Everywhere No Information to Read. Are we writing for visitors or for Google? While writing keyword rich content we forgot for whom we are writing. We trained writers to create content primarily for Google. SEO team started editing the content. And coercively added the keywords at the start of paragraph, center of the body and ended lot of keywords in summary. Redo the content. Remove unnecessary two phrase keywords, three phrase keywords from the content. Negative SEO has become new talk around the town. Will companies wage a bitter war against competitors for coveted no.1 position in Google? Is this become acid test to Google? So what is Negative SEO? Implementing techniques set as “spam” and “over optimization” by Google against competitors to push ranking down of competitor’s website. Now that Google introduced penalty against unnatural link building one can understand how this be used against competitors. This is particularly true of Dan Thies’ case. When Dan openly praised Google for going strong against blog networks and spam links some people who are upset about new update set Dan as symbolic target. Some one set 1 million scrapebox links. The result: Dan got warnings and lost some rankings. As the cliché saying goes, everything is fair in love and war. SEOs who believe in results and not ethics can use negative seo as a brutal weapon to overthrow competitors. How negative SEO can use as throttle? Building lot of anchor texts in quick time. Building links from irrelevant websites. Building too many no follow tag links. Copying the competitor content and publishing same in authority website. Not may all of the above work. This is just a wild guess and my personal thoughts and I don’t have any evidence apart from Dan Thies’ case. For the first time, SEO community looks divided. It’s I SEO versus you SEO. My SEO Company against your SEO Company.Until now people were following unethical practices to achieve rankings. Now people are affecting others website directly. Yes, previously too websites were affected but a position or two. Now the magnitude of consequence is unthinkable. Penalization may push you too low than you expect. Did Google made a wrong move? Without any iota of doubt, Google action is plausible. However, Google has little answer to help small business victims. How Google can judge one who submits website for reconsideration as a victim? Even Google finds this mess. Will this be considered as human intervention? Sure, Google will be already in action to overcome this loophole. One more update may come. It takes time. Let’s wait. Are you Looking for SEO Consultant to take your SEO and Social Media Marketing Activity to heights. Click, Web Analytics Consulting in Bangalore, India and Worldwide. Consult me for SEO Training in Bangalore, Individual and Corporate SEO Training. Rank your Website in First Page of Google in your Targeted Keywords. Get more enquiry and leads from Google and other Leading Search Engines. Increase your leads and business 10 Times more from Search Engines like Google, Yahoo, and Bing. Social Media Marketing/ Social Media Optimization. SEO Service Bangalore is a Search Engine Optimization and Internet Marketing Company in Bangalore with talented SEO Experts. SEO Service Bangalore provides SEO, PPC, Social Media Marketing, Online Reputation Management Service, Web Analytics Services to increase your no of leads and inquiry from GOOGLE and Other leading Search Engines. SEO Service Bangalore Provides Consulting in Search Engine Optimization, Pay Per Click Campaign, Online Marketing, Online Reputation Management, Social Media Marketing, Link Building, Keyword Analysis, Press Release, Article Marketing, Blog Marketing, Classified Listings, Yellow page submission, Business Listing, Local Listing and other online marketing and internet Marketing service to increase your visibility Online. 4. Become a student of SEO. If you’re taking the do-it-yourself route, you’ll have to become a student of SEO and learn as much as you can. Luckily for you, there are plenty of great Web resources (like Search Engine Land) and several terrific books you can read. Aaron Wall’s SEO Book, Jennifer Laycock’s Small Business Guide to Search Engine Marketing, and Search Engine Optimization: An Hour a Day by Jennifer Grappone and Gradiva Couzin are three I’ve read and recommend. 10. Open up a PPC account. Whether it’s Google’s AdWords or Yahoo’s Search Marketing or something else, this is a great way to get actual search volume for your keywords. Yes, it costs money, but if you have the budget it’s worth the investment. It’s also the solution if you didn’t like the “Be patient” suggestion above and are looking for instant visibility. 11. Use a unique and relevant title and meta description on every page. The page title is the single most important on-page SEO factor. It’s rare to rank highly for a primary term (2-3 words) without that term being part of the page title. The meta description tag won’t help you rank, but it will often appear as the text snippet below your listing, so it should include the relevant keyword(s) and be written so as to encourage searchers to click on your listing. Related bonus tip: You can ignore the Keywords meta altogether if you’d like; it’s close to inconsequential. If you use it, put misspellings in there, and any related keywords that don’t appear on the page. 15. Build links intelligently. Submit your site to quality, trusted directories such as Yahoo, DMOZ, Business.com, Aviva, and Best of the web. Seek links from authority sites in your industry. If local search matters to you (more on that coming up), seek links from trusted sites in your geographic area—the Chamber of Commerce, etc. Analyze the inbound links to your competitors to find links you can acquire, too. 18. Use social media marketing wisely. If your small business has a visual element, join the appropriate communities on Flickr and post high-quality photos there. If you’re a service-oriented business, use Yahoo Answers to position yourself as an expert in your industry. With any social media site you use, the first rule is don’t spam! Be an active, contributing member of the site. The idea is to interact with potential customers, not annoy them. 20. Take advantage of the tools the search engines give you. Sign up for Google’s webmaster Central and Yahoo’s Site Explorer to learn more about how the search engines see your site, including how many inbound links they’re aware of. Search Engine Optimization covers a huge range of tactics - all of which can bring direct benefit to a website. In this post, I've shared examples of different tactics used at different websites, and the effects that have been seen. If you're considering an SEO campaign for your site, or are trying to persuade someone else to invest in internet marketing, I hope this post will help demonstrate the potential of internet marketing. The post includes real screen shots from Google Analytics (click any of them to enlarge) but the sites and data have been anonymized. Remember that post about building a page with perfect keyword targeting? SEOmoz wasn't kidding around. Category and sub-category pages had a distinct lack of semantic HTML or term targeting. Getting appropriate H1 tags onto each page was a quick job, improving title tag structure took a bit longer, clean & friendly URLs and internal links with appropriate anchor text were also added. Before getting into the nitty-gritty of ranking factors for Local Search, dead simple tactics, etc, it's important to get the basics right. A large chain of restaurants created a 'bulk upload' file with the correct data for each one of their locations. After uploading the file, they applied for it to be reviewed and 'whitelisted'. Local data that's been uploaded by the business owner and whitelisted is treated as authoritatively as locations that have been manually verified by postcard. A current affairs magazine wanted to get more from their website. Because of falling advertising revenue, the publication was at risk of being closed down. They'd seen some growth from SEO already, but wanted to prove that the website had greater value. Although the site had a good brand and some great content, it suffered from similar problems to many news-type websites, including badly archived content, duplicate issues and a CMS that hampered keyword targeting or promoting individual articles. Recommendations were made to improve the site's architecture and migrate to the new structure. The effect of the changes was immediate growth which took the organic traffic to 257% in three months. A month later, the magazine's owner explained that the falling revenue from print advertising meant that they couldn't continue to lose money publishing the mag, and closed it down. An office cleaning company wanted to improve the profile of their site through SEO. Amongst other tactics, a member of staff spent a day writing a 'linkbait' post to publish on their blog. This generated huge amounts of traffic from social media sites (dwarfing their regular daily visitors) and was subsequently linked to from dozens of sites. This post, along with other content published on the site to attract links, helped the site grow in strength and authority, and it now ranks position 3 for 'office cleaning' in their country. This is SEOmoz, but I'd like to share a graph from a PPC colleague working on a site that sells scooters. They were initially bidding on very broad terms (scooter, scooters, buy a scooter, etc) but the campaign was adjusted to target more long tail terms, including descriptions, specifications, etc. This week, despite still being seriously under the weather (see this week's sad WB Friday), I flew down to SMX West to speak on the Link Building Strategies panel. Although I'd wanted to put more work in and deliver a better presentation, I received some very kind words afterward and requests from folks to share the deck via the blog. Before I embed the actual deck, though, I need to provide some context (as this isn't a wholly self-explanatory presentation). Twitter - every user of Twitter has an incentive to link to their profile so more people will follow them. This is also true of sites like Facebook, LinkedIn, DeviantArt, Etsy & others. Vimeo - nearly everyone who uses Vimeo appreciates the beautiful aesthetic they've created. The embeddable versions of Vimeo videos look and feel more professional and high quality than nearly any other player, hence they get embedded (a lot). This embed action automatically drives links back to the video on Vimeo's site, Vimeo's homepage and the user's profile, all with targeted anchor text. Urbanspoon - not only do they give badges to restaurants like Yelp and have started an online reservations system like OpenTable, Urbanspoon also features reviews from bloggers and foodies, who are then incentivized to promote their inclusion on the site. Last.fm - the widgets users embed on their site to share their favorite music automatically creates links back to the service. SurveyMonkey - a truly viral product (anyone who's surveyed is automatically exposed to the site), SurveyMonkey is inherently link acquisitive through the product. In order to use the service, you need to link to SurveyMonkey's site, where your form is hosted. Scribd - just look at the embed and the link below; 'nuff said. Miibeian.gov.cn - possibly the greatest link building strategy ever devised. The Chinese government requires that all websites in the country link to this site in order to operate legally; not too shabby, eh? Look forward to your comments about the presentation and the concept of productizing link acquisition into a site. 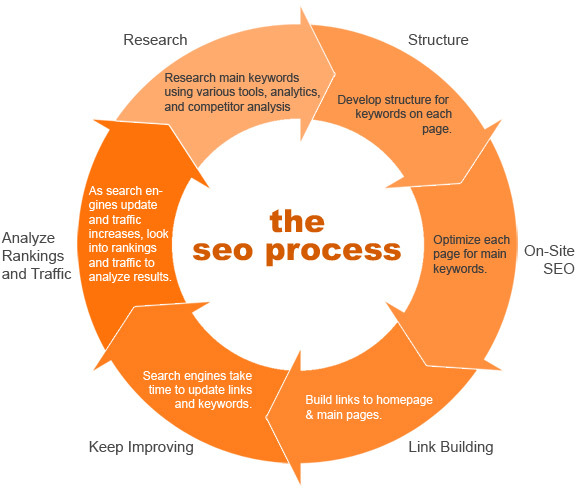 SEO Process Flow, How We start Optimization Process for a website. We understand your requirement and the key areas of your business to understand the thrust areas of your website which will help us guide your campaign in the right direction. Understanding the website structure, navigation and content requirements if any. Analyzing the Current status of the website on search engines. What is the competition we are dealing with. Success of search engine marketing largely depends on selecting the right keywords. With the above harvested information and Software tools ( which guide us in the most used search engine terms by visitors) we prepare a list of targeted keywords, and finalize on them on mutual basis. It's time to get down to the nitty-gritty and start utilizing them within the web pages. Applying the proposed website structure in terms of links and dynamics for better search engine indexing. Creating meta tags in tune with the prepared keyword list (Title, keywords, Description), after identifying the pages and their target keywords. HTML Code optimizing which includes setting up your home page W3C Compliant, and adding headings, image alt tags and hyperlinks. 3. Unique Title Tag for Each Page. 5. Meta tags keywords and description, should be entirely unique on every page. 7. Personally, I like putting the product/service description that appears on the related page in Meta description tag. 8. This will ensure unique content on each product/service page. 11. Google Webmaster Central login and sitemap submission and same for Yahoo, Bing. 13. Bread Crumb for Easy Navigation. 14. One fixed Bottom Navigation for better Crawling. 15. Using targeted keywords in right order and density for each page. 16. Adding your address in bottom of your page. Help you to rank better in Local listing and Maps. 5. Local Listings of your Business. 6. Business Listings in leading Business Directory. 12. Link Submission by competitor Link Analysis. Next I will come up with one by one services and details about SEO techniques.